The genesis of Magical Innovations was three friends coming together in 2004 to build a business that could make a difference in the world. We choose to build our business around a need identified by Vickie Dakin PT, during her 27 years as a pediatric physical therapist. What Vickie identified was a need for developmental toys that engage the attention of pediatric patients and holds the interest of both patient and caregiver and is appropriate for all children. Our own Vickie Dakin, PT designed out first Product, "Babie Rattles", for all babies with the particular needs of Preemie Babies in mind. Our baby rattles fill a void in the current market place for all babies as, apparently, few if any plastic type rattles are currently available for babies of any age. 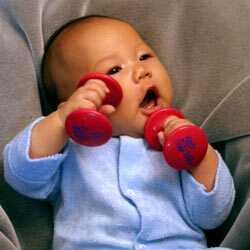 Our rattles, sized to fit a Premature Baby's Small Hands, are Balanced and Light Weight with a Soft Soothing Sound. These rattles are designed to facilitate Strength and Oral Motor Stimulation and holding two rattles facilities Mid-Line Play. Made in the USA these rattles of FDA approved ABS Plastic are Safety Tested and ASTM F963 Compliant. 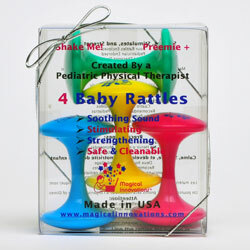 The rattles are packaged in twos in two models and in fours in a gift model. 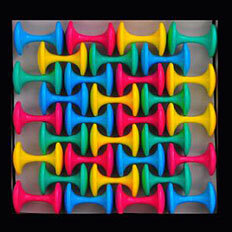 Free freight on the first order of $500+ when you mention the toy directory. Orders are shipped FOB Clearwater, FL.